The length of the hand is equal to one-tenth of the length of the body. Its width is roughly in the relation of the golden section, measured with the fingers together, although it varies according to one's constitution. Women's hands are often less than one-tenth the length of the body, and correspondingly narrower. The skeleton of the hand is composed of three sections: the carpals, metacarpals, and fingeerbones, with three corresponding groups of joints. 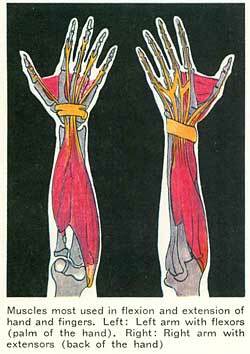 The wrist joint rotates against the radius (the ulna is too short to reach the wrist). The metacarpal joint lies between the carpals and metacarpals. It is not very mobile and serves simply to increase the elasticity of the palm. The two hand joints are moved by five muscles: ulna and radius flexor, ulna extensor, and one short and one long radius extensor. The fingers really begin with the four metacarpal bones, which are joined together in the carpas, or palm, by articulating muscles between them and by ligaments and skin. The separate fingers are formed each of three bones continuing from the metacarpals. Between the finger bones are knuckle joints, which are moved by long tendons from the flexor and extensor muscles attached to the upper and lower arm. The first finger joint also allows rotation, which is worked together with a stretching apart of the fingers by the muscles between the bones. The thumb turns the hand from a clamp into a holder. 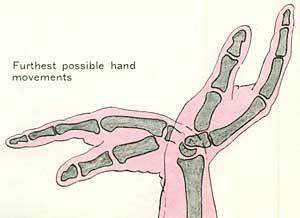 It is held opposite the fingers by a rotating joint between the wrist and the root of the thumb. The thumb has a series of muscles, especially around the lowest thumb bone, to give it a strong counterpresssure to the fingers. The outstretched fingers move with an increased bend towards the end, as though to hold a sphere the size of a soccer ball. If fingers and thumb bend further the imagined sphere grows smaller and the finger ends begin to move. They can curl up until they are tight against the fist, like a claw with concentrically approaching points. This movement is the key to many seemingly complicated positions of the hand. Its many bones and different muscles and tendons of different lengths make it into a splendidly sensitive instrument. Small wonder that it can reveal much about the nature of the person, with its gestures and positions, much of which can be reproduced by the artist. Often, characteristics such as grace, nobility, avarice, rapacity, or brutality are more easily seen in the hand than on the face. The reproduction of Titian's portrait should be examined once again in this light! A coarse hand should not immediately be accepted as a sign of coarseness, however. 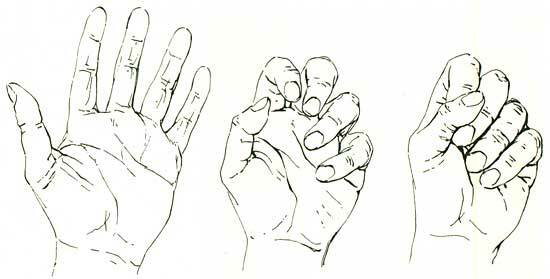 Quite often hands which look clumsy and ugly belong to sensitive and manually dexterous people. The author himself underwent an extremely painful examination of a wound by a doctbr whose hands were classically beautiful; she was so unsuccessful in her search, however, that she handed it over to her senior, a surgeon whose thick, coarse, peasant-like fingers did all that was necessary without causing a twinge.